If you’re new here, Welcome to Catholic Icing! I made a printable nativity set craft a few Christmases ago, and it’s been a very popular post. It’s free to download, and fun to make! 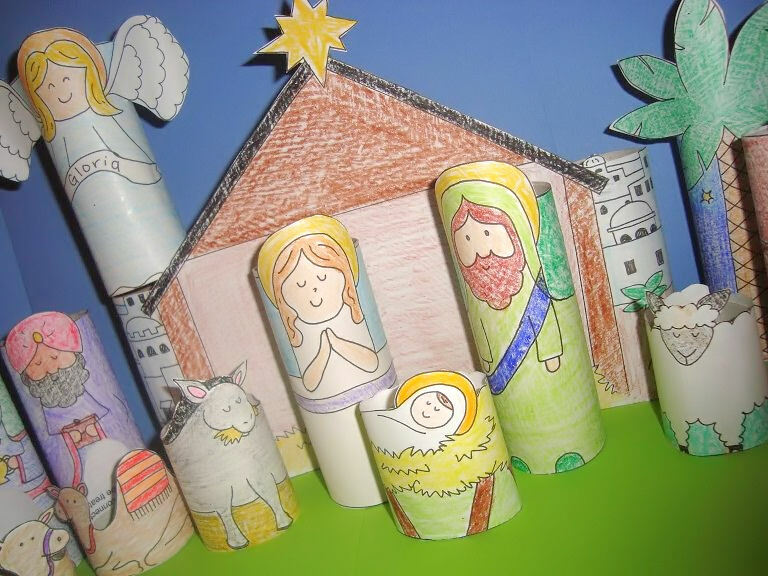 This nativity craft was originally designed to be printed, colored, and glued around toilet paper tubes to make the pieces stand up. Since then, many readers have discovered that it’s just as good to print the pieces on card stock, and then use tape or staples to make them into a cylinder. Attach the pieces to toilet paper tubes with a glue stick, staples, or tape. If you’ve printed them on card stock, just roll them into cylinders and tape or staple. Some of the toilet paper tubes for the shorter figures will have to be cut shorter first. For most of the figures, just glue the bottom even with the bottom of the toilet paper tube and let the heads hang off the top. A few of the pieces are different- see directions below. 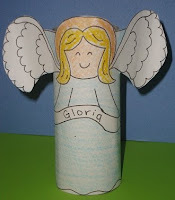 When gluing the angel, cut the bottom line of her wings and let them flap free- don’t put glue on the back of them! Then curl the wings out slightly with your finger. When gluing the empty stable, just glue each edge to a toilet paper tube half way around. 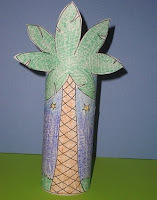 When gluing the palm tree, cut the leaves around the bottom, and let them stand out as well. Don’t put glue on the back of the leaves. Now Offering a New and Improved Download!!! Now that I’m self-hosted, this isn’t on Google docs anymore.You can now download the entire nativity in just one pdf! It turns out this download is missing 2 of the wisemen- *gasp*! But you can still access them from Google Docs. Download other wisemen here. Very cute. The pictures are nice too. Thank you. Thank you Lacy – this was very useful and easy to find on google!! I love LOVE love these!!!!! I really would like to make this for my daughter and teach her about Jesus’s birth. I printed the first page and I could only get the baby Jesus in a manger and a little bit of 1 of the camels. They printed teeny tiny too. Am I doing something wrong? Would it be to much trouble to email this to me as a pdf and I can print each individual page that way. Actually, I have been having some trouble with Google docs. Did you download it before you tried printing it? Sometimes that fixes it. Hopefully I’ll be hosting my own pdf’s soon! I knew there was a reason I have been hoarding tp rolls! This craft is perfect! My older girls are going to make this for my younger daughter’s birthday this week. Thank you for sharing this 🙂 BTW, I was able to download everything, no problem! I did have a problem with page #1, 2, 7 where it gave me a warning that said the page wasn’t safe. Is there any way you can email these to me? Thanks so much!!!! Maybe give it another try. I know a lot of people have been downloading these with no problem. Sometimes you have to click a box saying you “trust the site” or something. This is so cute. I’m excited to do this with my kids. Thank you for taking the time to make this AND share it. Thank you for this! I am going to make this with a special needs student during Sunday School throughout December. She will love it. Thank you so much for sharing these. They were exactly what I needed for my preschool Sunday school class! Thanks for sharing this! It’s adorable and I will be having a group of kids making nativities very soon! Lacy, I printed these off on card stock (heavy) paper. We then cut them out and taped the ends together. No need for toilet paper rolls. Plus they are easy to disassemble by removing the tape. Bonus is that they store flat. Thank you for making these available for people. It’s always nice to find ways to remind children about why we celebrate Christmas. This is a great thing to try! You know you have too much stuff “for craft…” when you find a really cool craft that calls for 13 toilet paper rolls — and you have them! Thanks so much for such a lovely craft project. I’ve not had any problems with printing! My son’s grade 2 class did this at his school in Colombo, Sri Lanka (his teacher downloaded it for the class to make). I thought it was so special that I downloaded it for my kids to make their own at home as well. Will try to make one for the grandparents too : ). Thank you for this–it’s a real blessing! Btw, at first I had problems with printing, then I right-clicked on the picture, it then gave me the option “print picture” which worked. The regular “print” icons didn’t. I’ve just finished printing this off, I’m excited to try this with the kids. I did find that I had to open the picture in a new tab to print and to enlarge to 145% to fit our toilet paper rolls. It still doesn’t cover it all but 150% printed off the page. I hope that helps those who are having trouble. Thank you. I did this last year with my daughter. I’m subbing in the 7-yo Sunday School class tomorrow and I’m going to have them do part of this. You have to download them before you can print them. I don’t have them saved on my computer anymore, so I only have the links now. Thank you for this printable nativity. I will print it and hand out to children at God’s Kitchen. It is a soup kitchen providing free hot lunches two times a week. I right clicked to copy, paste, and save in Paint program and will use Irfanview to print out the pages. Thank you for sharing my kids will love these. Merry Christmas. I am teaching the children (5-11) at my church and we are doping the Christmas Story. This craft is perfect 🙂 Thank you for posting! Thank you. I knew i was collecting those tp rolls for something. Thank you so much! I just completed this for my sons. So cute!! I am linking to this from my blog! I also tried to print the coloring sheets and got the error message. Could you email them to me? They are so cute!! Thank you! Thank you these so so fantastic! Perfect for my two today for a rainy day at home! Thanks so much, love it!!!! I love this!!! This is seriously cute. I’m a new follower. I also love this and would like to use it in my Sunday School class. I got the error message on the webpage to open the link. Could you please email the files to me to print? Sorry to double post…I overlooked your reply. Thank you!!! We were sure to give photo/idea credit, as well as a link back to your website, but we’d love for you to take a look at it. If there are any problems, we’ll be sure to take the feature down immediately! P.S. I teach a preschool class at my church and the kids have LOVED this nativity. It’s been a really neat addition to our Christmas lessons! Thank you! Thanks so much for linking! Glad your preschool class had a good time with it! This is perfect for some Christmas break activity time with my kids while they are out of school. Thank you for sharing your increadible talent. We will enjoy making them. 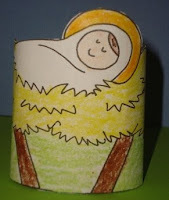 Thank you for sharing the nativity printable craft! It’s the best one I’ve seen! While we have no young children in our family, I loved your colored Resurrection TP printable so much, I printed it on photo paper and it was beautiful….and stood without the TP tube. Is there any chance you’d have the time to revisit this Christmas version and work your coloring magic. Thank you for sharing your wonderful site. Love your website! 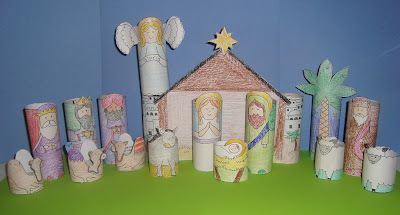 But lately I can not get things to print I would like to try the toilet paper roll nativity but when I click to down load it say server cannot be found and my internet explorer stops working. Could you please email me a copy. Thanks for all your wonderfull crafts!!!! Thanks so much for sharing such a great idea & lovely artwork. 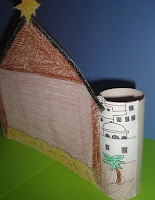 We’ll use the Nativity craft at our kids club over the next few weeks as we unwrap the true meaning of Christmas. Thanks a lot for your free pattern..My son and I can make this together..Happy Holidays! Just came across your site looking for “religious” Christmas crafts. I just wanted to take a moment to thank you for providing Moms like me w/ a great craft for our children at Christmas time. I can’t wait to work on this w/ my four kids. 🙂 God Bless you and have a VERY Merry Christmas!!! Thanks so much for sharing this craft. I can’t wait to try it with my Grade 2 class. I notice in your photo you have a blue background and green bottom. Any suggestions for what to use to hold the entire scene together? I should have been thanking you beginning some months ago, lol, your website has been such a blessing to me! I started teaching 1st grade CCD this year, and they have enjoyed many printables and more from Catholic Icing 😉 God Bless you for this service Lacy! Hi, I love this craft idea! Unfortunately I am having some trouble getting the PDF to open and download and print. I was wondering if you would have time to email it to me? I can see the PDF on my ipad, but it isn’t working on my home pc and I can’t print from my ipad. I have tried to open it this morning on my pc a few times without success. After doing my web search and browsing your site and attempting to download the PDF I encountered a virus. My husband was able to fix the virus, but then when I tried to download the PDF again the virus came back. I am not sure if the virus is related to the PDF, but I wanted to pass that along just in case. I was also unable to print the google docs file or save it to my computer. Could have just been because my computer wasn’t working properly, again just wanted to pass it on in case there is a problem. Thanks so much. We just moved and I don’t have the files on this computer to email you, but try downloading them from my Catholic ABC’s easy printing page: http://www.catholicicing.com/easy-printing/ hope this helps! I printed on cardstock – then printed the picture of your final scene onto photo paper. Now I plan to gift a few of these as “Nativity Gift Kits” with the picture, cardstock, and crayons for my friends with young children! THANK YOU! I printed these out for my home daycare kids. We cut them out and glued the stable into a box so they could play with them and have storage. Thank you! I want to you know that my 6 year old son made a set of these for both sets of grandparents, for each of his three aunts and for our house! 6 total sets!!!! We no longer have toilet paper tubes or show boxes but he has had a great time! Thank you for the free print out! I cannot wait to do this craft with our preschoolers. I took a collection at church for toilet rolls and have hundreds! Thank you for posting this! I live in Oliva, Valencia, Spain. We have two children 6 (Laude) and 9 (Sara). As soon I see your Nativity printed set craft I called my children and they were very happy to make our Nativity that way. They are already working on it (very quitely by the way …!!!). Thanks very much for sharing it with us. Thank you for sharing. I’ve been trying very hard to find the right nativity cut outs to make puppets with and these were perfect. I’m just getting a head start for Christmas. We used your easter version this year and LOVED it, and I didn’t want to forget to have these ready for the end of advent. Just a note, your wise men are all in there now, so you can remove your disclaimer. God bless you. Love your site! Really fantastic!. There’s already one made in Valencia, Spain. Personally I think the one who most enjoyed has been …myself (the father!!). We have two little children, Sara of 9 and Laude of 6. Congratulations for you idea and your generosity. Thank you for posting this! I have the paper rolls at the ready but I am not at all an artist. This will be a great project for my girls! We have enjoyed making ALL of your paper roll play sets. We are making the nativity and I was wondering if you could draw an Angel Gabriel angel to include so we can also act out the annunciation! Thanks for all your ideas! They are awesome! Thank you, Lacy, for this nice nativity set. I really appreciate it. This really is a great way to stay formed. I know my garage area and basement are a definite mess. I in the morning undoubtedly designing upon making anything in this way. What a great idea! 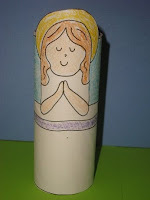 I was searching for an easy and fun project to work with my thrird graders and I came across this Nativity project.